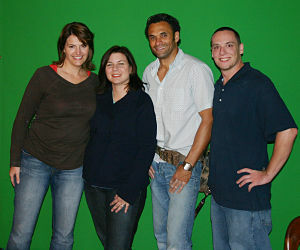 Me, Amy (a friend), TLC’s Andrew Dan Jumbo, and Bob (housemate) lined up in front of the green screen for this photo. The show “Take Home Handyman” shot at my house for 3 days, upgrading my home office. It was a true “behind the scenes” for my friends and I. One of the most popular types of benefit auction items I sell are those having to do with the entertainment industry, such as “behind the scenes” activities for television shows. When a show donates a “behind-the-scenes experience,” it usually means that the winning bidder will get to watch a show being taped and perhaps a tour of the facility. For someone who hasn’t worked in the television industry, a taping can be exciting to watch. Here are some tips on securing these sought-after experiences. Amy snapped me telling all the behind-the-scenes secrets here. 1. Ask family, friends, and everyone on the auction committee who they know! Even when you think no one has a connection, you can be surprised. An email to your contacts might bring out a potential link. An auction committee here in Washington, D.C. unknowingly had a former costume designer from New York among them. When we discussed behind-the scenes activities for shows, she immediately thought of friends she could ask for passes. She secured two passes to Saturday Night Live’s dress rehearsal in New York. It was very easy for her to get the passes, but she hadn’t even thought of asking her New York friends until I started to talk with the committee. Your nearby cable company likely produces shows airing on local cable channels. Research online. We have many shows taping here in Washington, D.C. (e.g. The NewsHour with Jim Lehrer, Pardon the Interruption, This Week with George Stephanopoulos, etc. ), but to prove you can do this in your own locale, I researched another city. A Website search of local Channel 6 in Lawrence, KS led me to find six shows being produced by Free State Studios Productions. Shows like Jayni’s Kitchen (a hairdresser who has her own cooking show) or The Drive an unscripted sports talk show featuring four local pundits) might be willing to have guests sit and watch one of the episodes being taped. Watching a local cable show might not carry the same panache as watching Glee, but you’ll be surprised at how many people think it’s cool. Consider reaching out to any show shooting within a 2-hour radius from where you live. It might be that one of your benefit auction committee members even knows someone working on the show. If you live in a city where one of the larger networks has a presence, ask if you can have a facility tour. A tour won’t sell as well as a behind-the-scenes “live” experience, but it offers a one-of-a-kind angle. P.S. 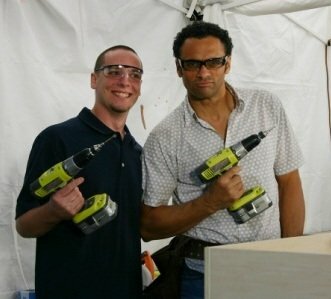 To watch an edited video of my episode of Take Home Handyman, click here.